The Chang'e-4 spacecraft has successfully made a scheduled trajectory correction manoeuvre (TCM) as it continues its journey to the Moon and eventual attempt at landing on the lunar far side. The manoeuvre was carried out at 08:42 UTC (16:42 Beijing time) on Sunday to ensure the consistent and stable path of the spacecraft following launchand trans-lunar injection (TLI) on December 7. 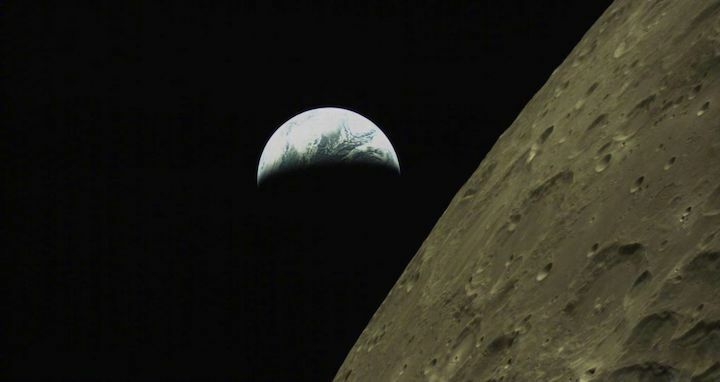 "We have just completed the second orbit modification for Chang'e-4 and then we will conduct the third one to ensure that it can precisely enter the lunar orbit and prepare for a soft landing of the probe," Li Peng, an assistant engineer with Kashgar Observation and Control Station, told CCTV. The first correction, scheduled for 11:42 UTC Saturday, was considered unnecessary due to the high degree of accuracy of the launch and TLI and thus cancelled. A third TCM for Chang'e-4 is expected on Tuesday, ahead of lunar objection injection on Wednesday, December 12. Ground stations in Kashgar and Jiamusi in China under the Xi'an Satellite Monitor and Control Centre are among those responsible for tracking Chang'e-4 and sending commands to the spacecraft. China also has ground stations for deep space communications in Namibia and Argentina which play a part in the Chang'e-4 mission. The Chang'e-5 sample return mission, which could launch in late 2019, will be supported by European Space Agency facilities in Kourou in French Guiana, and Maspalomas in the Canary Islands. The China Aerospace Science and Technology Corporation (CASC), the main contractor for the Chinese space programme, stated in a now-deleted WeChat post that the journey time to the Moon would be 110 hours from launch (at 18:23 UTC on Friday), some two hours less than Chang'e-3 in 2013. That would mean lunar orbit insertion for Chang'e-4 could be expected around 10:30 UTC on December 12. 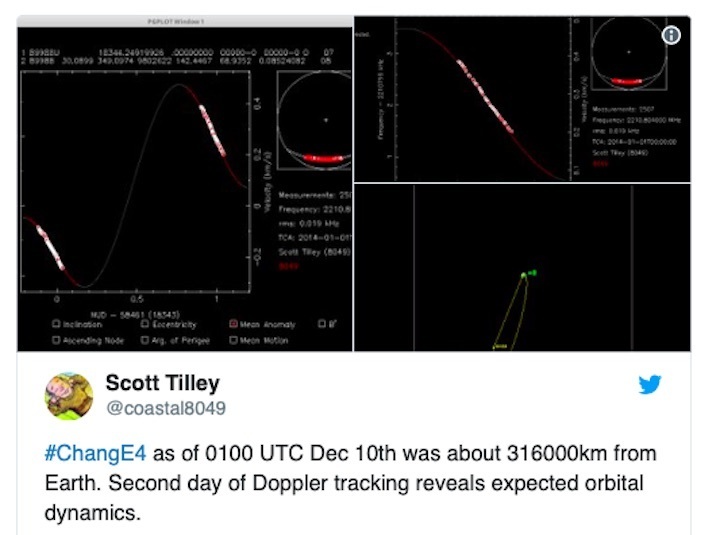 Meanwhile amateur radio observers outside of China have been tracking the progress of Chang'e-4, stating that the indications are that everything is on track. If Chang'e-4 arrives safely in lunar orbit, having fired a long burn of its single main engine, the actual landing attempt will likely not take place until the first days of the New Year. The spacecraft will first need to test communications with the Queqiao relay satellite, which is required for contact with Chang'e-4 on the far side, and optimise its orbit to target the expected landing site within the South Pole-Aitken Basin (SPA), a huge, ancient and scientifically significant impact crater on the far side of the Moon. The landing site is understood to be, but not officially announced as, the 186-km-diameter Von Kármán crater. The attempt to set down on this relatively flat area of the topographically highly variable far side of the Moon will then take place after sunrise over the area, in late December, which would provide the spacecraft with power and allow operation on the lunar surface. The Chang'e-4 lunar lander and rover have launched and are heading for the Moon after years of preparations for a hazardous and unprecedented landing attempt on the lunar far side. The Chang'e-4 lander, carrying the small rover, will then prepare for the first-ever landing on the lunar far side, sometime after sunrise over the likely landing site within the Von Kármán crater and likely in the first few days of January. Originally the backup to the 2013 Chang'e-3 lunar lander and rover mission, the Chang'e-4 lander has a dry mass of around 1,200 kg and carries the 140 kg rover. At liftoff with propellant, the spacecraft had a mass of around 3,800 kg. The single main engine will fire to slow the craft in order to enter lunar orbit. The Chang'e-4 spacecraft have been developed to meet the new challenges this ambitious mission will bring. 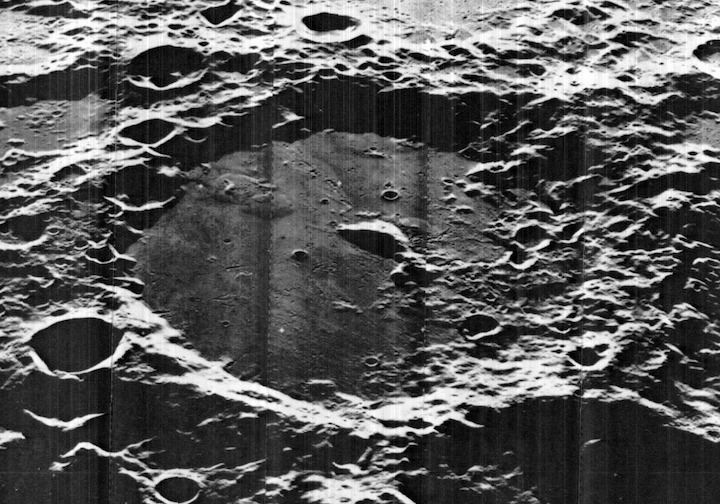 "Most of the far side of the moon is covered with high mountains, impact craters and lunar craters. It is difficult to find a large and flat area. This requires us to be more accurate in fixing the landing site," Sun Zezhou, chief designer of Chang'e-4, told China Central Television (CCTV). China landed the Chang'e-3 on Mare Imbrium on the near side of the Moon in December 2013, but this follow-up mission is more difficult. The more variable and rugged topography of the Moon means selecting both the target area and executing the landing are much harder tasks. CCTV reports that the lunar landscape will also affect the probe's judgment of the spacecraft's distance to the surface of the moon and the relative velocity, requiring the adoption of a special design for the navigation control. "There are some differences between Chang'e-3 and Chang'e-4," Sun says. "The Chang'e-3 landed on the Moon following a parabolic path, but our Chang'e-4 will primary land vertically,"
With no access to solar energy, Chang'e-3—which is apparently still waking up each month—would power off during the 14-Earth-day-long nights on the Moon and all electronic equipment would stop working. But Chang'e-4 is equipped with a radioactive heating supply system, which will allow experiments such as temperature measurements of the lunar regolith. The Chang'e-4 mission also requires the use of a relay satellite to achieve communication between the far side of the Moon, which never faces the Earth, and deep space tracking stations on the ground. The Chang'e-3 rover travelled just 114 metres before suffering a fault which left it immobilised during its second lunar day on Mare Imbrium. It still used its instruments to return brilliant images and fascinating science. The design life is understood to have been extended from the three months for Yutu to up to a year for Chang'e-4. 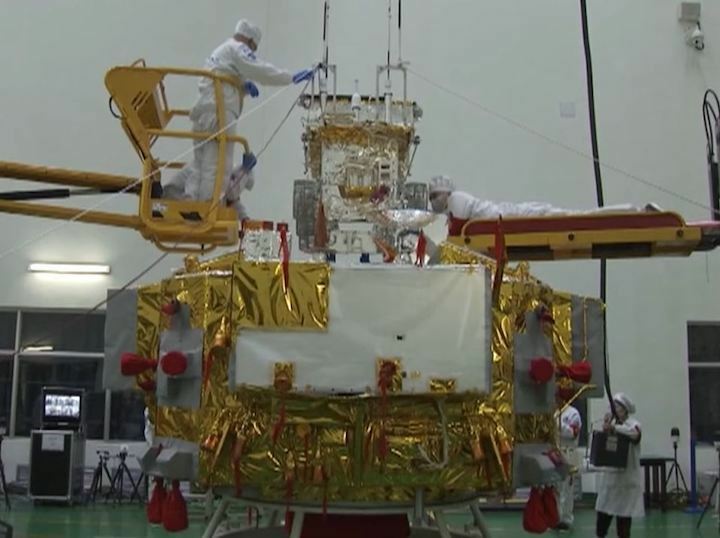 The Chang'e-4 rover will not, like the Chang'e-3 rover above, have an arm at the front for the alpha particle X-ray spectrometer (APXS), as it is not present. Instead the new rover carries the Advanced Small Analyser for Neutrals (ASAN). One different between the Chang'e-3 and -4 landers is the addition of three five-metre-long booms, illustrated in the above render, for the Low Frequency Spectrometer (LFS) science payload. “The [far side of the] Moon can well shield the Earth’s own low-frequency radiation and create a better environment with low frequency and noise. This could help the probe detect the low-frequency signals from the Sun more effectively,” said the Chang'e-4 chief designer. China's Chang'e-4 lander and rover arrived in orbit around the Moon on Wednesday following launch from Xichang, southwest China, on December 7. The spacecraft fired its main engine at 08:39 UTC (16:39 Beijing time) to perform a braking burn and achieved lunar orbit at 08:45 UTC. The Chang'e-4 lander and rover will now carry out tests with the Queqiao communications relay satellite positioned beyond the Moon, and adjust its orbit in preparation for a soft-landing on the far side of the Moon. No such landing has previously been attempted. Challenges include establishing communications with the lunar far side which is never visible from Earth, and the rugged landscape of this unseen hemisphere. The landing attempt is set to take place in early January, once the 14-Earth-day lunar daytime begins over the candidate landing sites in the South Pole-Aitken Basin. Chang'e-4 lifted off on Friday and underwent one trajectory correction following trans-lunar injection. 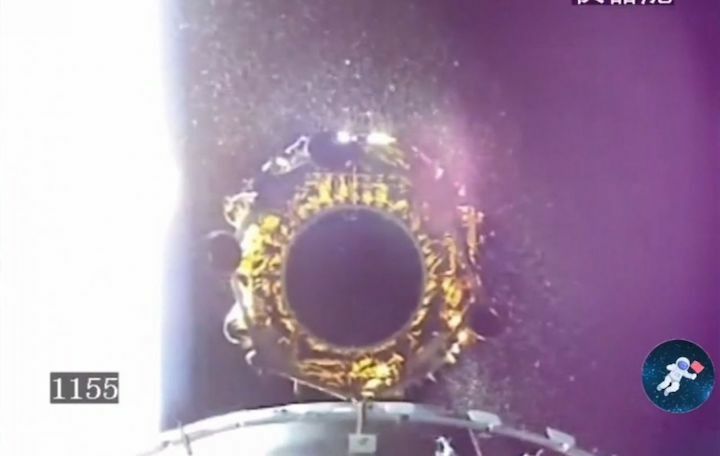 The Chang'e-4 spacecraft has made contact with the Queqiao relay satellite orbiting beyond the Moon, according to the China Academy of Space Technology (CAST), which made the spacecraft. Chang'e-4 was launched on December 7 and entered lunar orbit on December 12, where it began refining its orbit and prepared for conducting communications tests. CAST, in a Wednesday social media post (Chinese), stated that Chang'e-4 has had several "phone calls" with Queqiao while around the Moon, with a 'good' signal. The mission will be the first to attempt a landing of the far side of the Moon, which never faces the Earth due to tidal locking. The Queqiao satellite, positioned around the gravitationally stable Earth-Moon Lagrange Point 2 beyond the Moon, is thus required to relay communications between the Chang'e-4 lander and rover on the lunar far side and terrestrial tracking stations. Chang'e-4 is expected to make its landing attempt in the South Pole-Aitken Basin in early January, with the targeted site understood to be the southern floor of the 186-km-diameter Von Kármán crater. The Von Kármán crater offers a relatively flat area on the far side, which is much more topographically variable than the near side. The landing will still pose new challengesfor China's space engineers. The lunar far side looks very different to the near side, with greater visible crater coverage and few of the maria—or dark basaltic 'seas'—created by lava flows that we can see with the naked eye on the near side. Why this is so remains a mystery and the answers will help our understanding of the Moon's history and even the development of the solar system. The Queqiao relay satellite was launched in May and in June established its intended halo orbit at the second Earth-Moon Lagrange point, some 65,000-80,000 kilometres beyond the Moon. Queqiao is equipped with a 4.2 metre diameter parabolic antenna to enable it to relay data between ground stations on the Earth using S-band and the lander and rover using X-band. The satellite also carries the Netherlands-China Low-Frequency Explorer (NCLE), which has been developed by Radboud University in Nijmegen and other institutions in the Netherlands. It will attempt to look into the cosmic 'dark ages' after the lander and roving section of the mission. 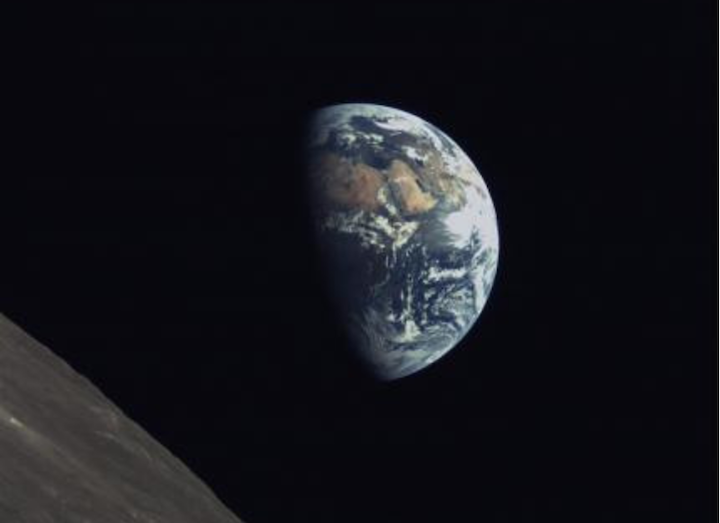 The Chinese Chang'e-4 lander and rover are currently in lunar orbit awaiting their attempt at the first ever soft-landing on the far side of the Moon and potentially bring new understanding of the Moon and the wider solar system. A number of candidate landing sites have been analysed by separate teams for Chang'e-4, mainly within the South Pole-Aitken (SPA) basin, a huge and ancient impact structure which may contain exposed material from the lunar upper mantle and clues to the development and history of the Moon. SPA is the Moon's oldest impact basin and stretches from the south pole up to Aitken crater. It is of huge scientific interest and is cited in the US Decadal Survey as holding answer to several high-priority science questions, and could boost understanding all of the terrestrial planets in our solar system and the timing and character of the late heavy bombardment. Site selection for the mission is complicated by constraints such as the far side having greater crater coverage and variability in surface altitude than the near side, and illumination occlusion from the lunar terrain, which means the mission requires a much more accurate landing than predecessor Chang'e-3. Von Kármán will offer the change to analysis the variations of composition of the lunar surface and SPA melt sheet with the Visible and Near-Infrared Imaging Spectrometer (VNIS), while also returning unprecedented images with cameras on both the lander and rover. Ba Jie, noted in the map above, is an informal name for a small crater just west of the landing region, notes Phil Stooke of the Centre for Planetary Science and Exploration at the University of Western Ontario, which refers to a story in which Zhu Bajie (or Bajie) was expelled from heaven after harassing Chang’e, the Chinese goddess of the Moon for which China's lunar exploration missions are named. Stooke has also mapped out the other candidate sites noted in papers on the upcoming Chang'e-4 landing, such as Apollo crater, which was understood to be the early prime contender. The current understanding is that Chang'e-4 will attempt to set down around January 3 UTC, having altered its orbit following lunar orbit insertion on December 12 and tested communications with the Queqiao relay satellite, a prerequisite for the far side landing mission. An official announcement on the timing is awaited. The vast majority of the far side of the Moon never faces the Earth due to tidal locking, and humanity's first glimpse of that hemisphere of our celestial neighbour did not come until the Soviet Luna 3 mission sent back images in 1959, and the Apollo 8 astronauts in 1968. The Chang'e-4 mission is ready to proceed following the May launch of the Queqiao relay satellite, which in June established its intended halo orbit at the second Earth-Moon Lagrange point, some 65,000-80,000 kilometres beyond the Moon. From here Queqiao (referring to the 'magpie bridge' from Chinese mythology, which helps the cowherd and weaver girl cross the Silver River (Milky Way)) will be able to simultaneously contact tracking stations on Earth and the spacecraft on the far side of the Moon and relay communications with its huge parabolic antenna. Surprisingly the far side looks very different to the near side, with greater visible crater coverage and few of the mare, or dark basaltic 'seas' created by lava flows that we can see with the naked eye on the near side. Why this is so remains a mystery and the answers will help our understanding of the Moon's history and even the development of the solar system. The Chang'e-3 mission in December 2013 featured close-to-live footage of the landing on Mare Imbrium on the near side, but it is unclear if such coverage will be available this time around. Launch of Chang'e-3 was broadcast live, whereas Chang'e-4 was only viewable via an unofficial stream from spectators. One possibility for coverage is YouTube channel for state media CGTN Live. The Chang'e-3 landing full video in HD.